We were lucky enough to be upgraded to premium economy on our outbound flight but flew home in economy class. On the way to Orlando, we were greeted on the flight with a nice glass of sparkling wine, hot towels and had a pillow and blanket too. It’s little things like this that make all the difference, as the blanket was better quality than the one you receive in economy and so you don’t find yourself covered in little bits of fluff. The service on board was fantastic; very friendly staff, which is always good, and nothing was too much for them. We had one of the refurbished aircraft on both flights. These had touch screen TVs with a very good choice of shows, music and films, regardless of whether you are flying in economy, premium economy or business class. They also have a feature, which is similar to texting. If you know people a few rows back or in a different class, you can enter their seat number and can chat with them throughout the flight. The seats were all very comfortable with adjustable headrests and generous legroom. We had the bulkhead seats while in premium economy and were able to stretch our legs out fully in front of us. This makes a big difference when on a long haul flight. There was a good choice of food available with freshly baked rolls. We even had the use of metal cutlery and china bowls in premium economy. Dinner was also followed by a nice glass of brandy or Baileys. Our first hotel was the Springhill Suites in Orlando. I was very impressed with this hotel; the reception was open and welcoming, the staff were very friendly and we had good views of Seaworld from the hotel too. In fact, it was so close you could even hear the screams coming from the roller coaster and the sound of the seals and sea lions. The rooms at our first hotel were a very good size and would be perfect when travelling with children. In the rooms were 2 king size beds, flat screen TV, kitchen facilities and a large corner sofa. On arrival in the room, we had a Shamu teddy and cake in the shape of Shamu on the beds for us. With it being a Seaworld hotel, all children will receive this on arrival at the hotel, which I think is a very nice touch. The hotel is one of a few that offers breakfast. I thought this would be very basic, but there was a good choice of cereals, hot food, bagels, fruit, yoghurts and you can even make your own waffles. The only downside was that you have to eat from paper plates and use plastic cutlery. Springhill suites are only a few minutes’ walk from Seaworld and Aquatics and just around the corner from Discovery Cove, but there are shuttle buses available too. On the same site as the hotel, there are restaurants and a 24-hour drive-through pharmacy. Our second hotel was the Guy Harvey Tradewinds Hotel at St. Pete’s Beach. I liked this accommodation as it had a very Caribbean feel to it and made you feel like you were somewhere exotic. Again, the rooms were a very good size, with 2 king beds, a separate living room, kitchenette and large bathroom. The only thing I didn’t like about this hotel was that the kitchenette was in the same room as the bedroom. The decor was very bright with lots of flowers, however, we were advised that they are in the process of refurbishing the rooms and the rooms will all be neutral colours once this has been completed. The hotel is located directly on the white sand beach and you can use all the facilities of the sister hotel which is a few minutes’ walk along the beach. It may, therefore, be a better option to stay at the sister hotel if you would prefer the facilities to be on your doorstep. A word of warning, though; the hotel does experience a lot of noise from the local bars throughout the night. We were very lucky and had so much included in our trip…. Our first day was at Seaworld and we got the chance to enjoy one of the private guided tours. This is available to customers to purchase at approximately $35 per person and includes animal feeds, fast track to the rides and also a guided tour of the park and the rehabilitation centre behind the scenes. Also included are vouchers for lunch which can be used at several of the restaurants in Seaworld. On the second day, we were given entry to Aquatica, Seaworld’s own water park, with unlimited food and drink. This was another fun day and there was so much to do to keep us all busy. Our next park included was Busch Gardens and again we were given one of the private guided tours. This was very similar in cost to Seaworld, with animal feeds and fast-track for all of the rides included in the price. It also included a 30-minute safari trip by jeep; about 10 minutes of this was spent with feeding the giraffes, which was amazing. Once again we had meal vouchers for lunch included. Our last day was at Discovery Cove, where we had our dolphin swim. Discovery Cove is all Inclusive so you have all your meals, snacks and alcoholic and non-alcoholic drinks included throughout the day. 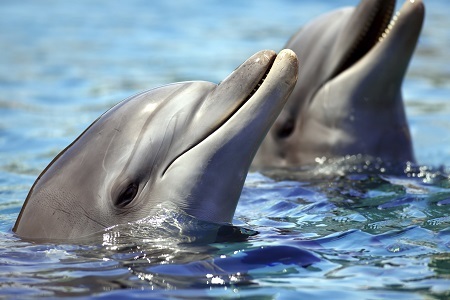 You are given a 30-minute dolphin swim at your allotted time, followed by time to view your photos from the experience. These are available to purchase along with a DVD too. We only had to pay for one lunch throughout the whole trip, which was when we had the day at the Florida Mall. All meals were hosted by hotels so we had a very short guided tour, before sitting down to dinner and drinks. I couldn’t pinpoint a single moment of the trip, as I loved every minute of it. At Seaworld, we had the chance to feed the stingrays and the sea lions, which was amazing. The Shamu show was also one of the best Orca shows I have ever seen. There is also the Turtle Trek, which is a very moving 3D film about the life of a turtle; making you feel like you are there in the ocean. We also went behind the scenes to the rehabilitation centre and got to see some of the animals there whilst the staff explained what they do. Some of the stories were so sad and made most of us quite tearful! It was amazing to see some of the animals after what they had been through and to see how happy and well they are now. Seaworld also has one of the best log flumes I have ever experienced and the Manta roller coaster was a definite highlight. This made you feel like you were travelling like a stingray! Busch Gardens was another major highlight of the trip; it really does make you feel like being in Africa. My best part of the day here was feeding the kangaroos and the short safari to feed the giraffes, too. I have fed Giraffes before but this felt like we were out in the wild with them and is something that you have to do before leaving Bush Gardens. There is such a big choice of roller coasters here too and, although I didn’t experience too many of them, I enjoyed every minute on the ones I did, such as the Cheater Hunt. This was one of my favourite rides as it made you feel like you were running through the wild like a Cheater. We also went on the Rapids here. I have never laughed so much in my life. I would recommend saving this for the end of the day as you will not have a single dry part on you when you come off! The last highlight of the trip was Discovery Cove, where we had our dolphin swim. We had half an hour in with the dolphins where we had hugs and kisses, followed by our swim. You cannot visit Discovery Cove without experiencing this. There is so much more to this park than I had realised too. They have a pool where you can snorkel with the fish and stingrays and as you are swimming along you can look to the side and on the other side of some glass are sharks; it makes you feel like you are in swimming with them too. You also have the heated relaxation pool which is nice to lay and have a few drinks, but you can also go for a swim here too. This time, on the other side of the glass, there are otters. There was nothing I could really fault about our whole trip and we had lovely hotels throughout. One thing I would say is that you would certainly need more than a couple of days at Seaworld and Busch Gardens. There is so much to see and do at both of these parks and one day is just not enough time to get the full experience. We were unlucky to miss the dolphin feed and to experience their show at Seaworld as there weren’t enough hours in the day to fit it all in. Again, at Busch Gardens we didn’t have time to experience all of the roller coasters or to see the entire park, so it would be great to give yourself at least another day to have time to do this. I would definitely recommend this trip to everyone; families and couples of all ages. There is so much to see and do at all of the Seaworld Parks. Whether you like interacting with animals, going to the cinema, riding roller coasters or visiting aquariums, these parks have it all. 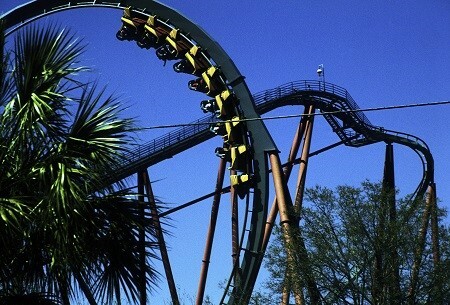 Paying the extra to have the tours added to your visit to Seaworld and Busch Gardens is a must. It saves so much time queuing for the rides, includes the food for the animals feeds and also lunch. By the time you have paid for each of these things individually, you would have spent much more than the ticket costs. Plus you have the knowledge and experience of you guides at your disposal who make the experience so much more special. I would also recommend that you tie in some time at one of the beach resorts. Visiting the parks can be very tiring and it’s nice to have a few days, either in the middle or at the end of your holiday, to unwind from constantly being on the go. Thank you to Virgin Holidays and to Fred. Olsen Travel for giving me the opportunity to experience this. This is not the usual holiday I would consider for myself but I already can’t wait to go back again. 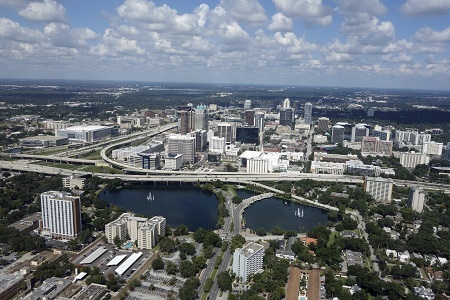 Book Orlando for your next holiday with the help of our expert team of travel professionals. Whether you are looking to arrange a family trip or couples break, we can assist in finding you the perfect package. We can also help organise your travel extras such as airport hotels, coach transfers and car hire.